When it comes to buying wicker furniture for your outdoor space, there are a lot of options and choices. The first is the choice between the type of wicker: natural or synthetic. Natural wicker, as the name implies is made from natural materials like bamboo and willow and these are woven over wooden frames. Lets start with the advantages of using natural wicker. First of all, natural wicker looks amazing. Because it is wood, it takes colors well and can be painted whenever you feel like a color change. For the very same reason, it is also easily stained. It is best to avoid keeping wicker chairs in areas where debris can fall. Direct sunlight can cause it to fade. While this can be discouraging, if your furniture is not used much and is stored until use, then you should have no problems. It is for those very disadvantages that synthetic wicker is more popular. Synthetic wicker is made from a plastic resin. Because it is plastic, it is good in all weather conditions. This wicker shaped plastic resin is fixed onto a rust proof aluminum frame. 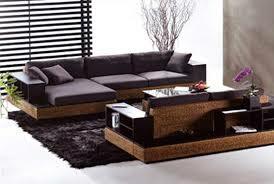 As a result it is perfect for any type of outdoor furniture and can be used to make a wicker sofa. In terms if aesthetic, it looks very similar to natural wicker. Your choice will depend on your environment and how often it will be used. Everyone loves the class and comfort of wicker furniture. If you’d like to find some for your home or business, Wicker Paradise has everything you need from indoor wicker furniture or for an outdoor patio and at prices you’ll love.